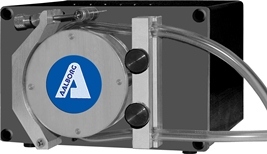 The TPU Pumps Heads by Aalborg Instruments are mounted on a front panel with an adjustable occlusion wall and safety cover. Installation is quick and easy by simply attaching the pump head to the motor using the existing mounting holes. The heads are designed for low to high viscosities and fluids never touch the pump head. Features for the pump heads include 4 rollers (TPU 1) or 10 rollers (TPU 2) to minimize pulsing, stainless steel rollers and shafts, mountable in any directions, and long tubing life. The maximum lift is 340 in. H2O (12.3 psig) and maximum suction is 350 in. H2O (12.6 psig). The pump head, the tubing’s inside diameter, and the motor’s RPM affect the flow rate.